Saw three electrical engineers the other day all working away on the installation of one of those new Huge Great Big Grey Boxes. 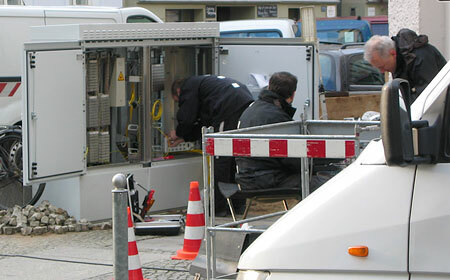 One guy was installing some hardware, while the other two were using some kind of special fibre-optic sewing machine to bundle the incoming wires into groups. The other night I took a DVD back to my local rental store, a route which takes me past my own Friendly Neighborhood Huge Great Big Grey Box. I was a little disturbed to find out that these things buzz savagely 24 hours a day.